Negative Temperature Coefficient NTC Thermistors are semi-conductor non-linear resistors, which alter their resistance characteristics with temperature and the resistance of the NTC thermistor will decrease as the temperature increases. 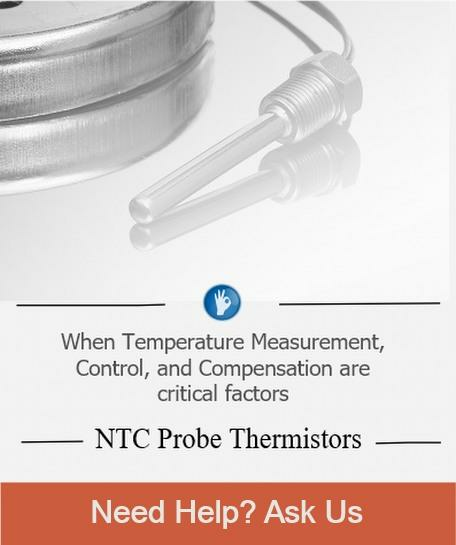 Ametherm’s NTC thermistors are manufactured from a specially-formulated high quality metal oxide ceramic material which is extremely accurate in sensing temperature used in Temperature Measurement, Compensation, and Control applications. NTC Thermistor Probe in Ring Lug. Available in a variety of housings with custom design capabilities. Easy and secure surface mounting and fast response time. NTC Thermistor Probe in a Threaded Hex Nut. These thermistors are potted inside an aluminum hex screw with straight threads. Rugged and cost effective. NTC Thermistor Probe in Stainless Steel housing with a Threaded Long Tip. They are potted at the tip of a durable stainless steel alloy tube with a tapered thread hex screw. NTC Thermistor in epoxy encapsulation. Epoxy dip coated and soldered between jacketed Teflon/PVC wires. Small dimensions allow easy installation. Point or curve matched. Customizable and cost effective. NTC Thermistor Probe in a Stainless Steel Housing. Potted inside durable stainless steel alloy tube and epoxy filled. Humidity resistant, fast response, rugged construction and cost effective. Nickel Barrier End Band Surface Mount Thermistors. These thermistors provide an alternative to thermocouples in precision circuits. Configuration options include Bulk, Tape & Reel, Two-Sided and Wrap Around Terminations. Accu-Curve Precision Interchangeble Thermistors offer interchangeability over a broad temperature range and eliminate the need to individually calibrate or provide circuit compensation for part variability. Disc and Chip Thermistors are manufactured with or without coating with tinned copper leads. Wide resistance selection. Cost effective with fast response times to (±1%). These thermistors are for higher temperature applications. Hermetically sealed, these thermistors eliminate error in resistance readings due to moisture penetration. The information you need is just a click away! Our products are available for immediate delivery through our network of distributor partners.